Telescopes aren’t the most common gift to appear under the tree or in a stocking but when they do, you’ll know it was for a special someone. Though not as openly discussed as binoculars or spotting scopes, telescopes contain the most powerful optics in the world, and for good reason. That power can be in your hands this holiday season, as there is a number of popular telescopes on the market that are family and user-friendly. There are some telescopes that can even be controlled with an app on your phone. If you or a relative are entirely new to astronomy and telescopes, check out our beginner’s guide to astronomy. Nothing really beats the old point and look method, which is why most companies provide you with an interstellar map to guide your nighttime viewing. If you don’t find a telescope on here that you like, check out our picks for the best telescopes of 2018. 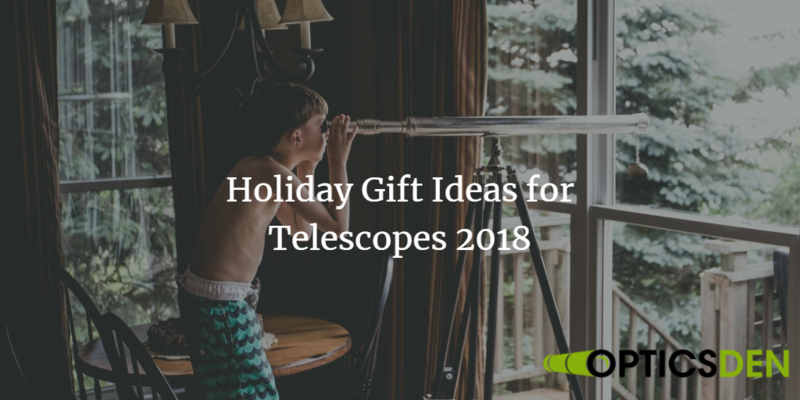 Do Telescopes Make Great Gifts? Celestron is well known for their diverse and ever-growing catalog of telescopes. Astrophotography is an ability that was previously only available to scientists and professional astronomers. Now, if you are looking to get a great picture of a planet or object, the NexStar is the telescope for you. Lightweight and below $100, the Space Eye is the perfect children’s or beginner’s telescope that simplifies the astronomy learner’s process. It’s a lot like the old point and look telescopes and you’ll have to do some fiddling by hand. But there isn’t a more perfect time to learn the basics than at a young age. The AstroMaster is the ideal hobbyist telescope with a wide range of power levels. Whether you want to take pristine shots of the moon or up close photos of birds, the AstroMaster will get it done. With its moderate size, it’s the ideal telescope to take on trips or outdoor excursions to escape light pollution. THe VX 8″ is one of the more powerful telescopes on our list and is equipped with a German equatorial mount. This mean’s the telescope and its turning mechanisms are aligned with the Earth’s, giving a better chance to seem rarer objects in the sky. The German equatorial mount isn’t a widespread telescope mount, hence the high price tag. Like we mentioned, it isn’t always that you see a telescope under the tree. That’s why it’ll be more than just a great gift, it’ll be a great surprise for the astronomer or budding explorer in your life. Telescopes aren’t cheap, so that’s why it’s important to catch them on sale this holiday season. Some telescopes have shorter range optics so their ideal for other activities like birding, which requires about the same amount of patience that astronomy does. If your relative or friend already has a telescope, you could also look into additional or alternate lenses for that specific telescopes. Most telescopes nowadays have interchangeable parts that are perfectly compatible with parts built by other companies. You’ll want to do some research beforehand, however. Click here for a guide to the best telescope accessories available. Don’t feel as though you are limited by the stock options on your telescopes. While some telescopes can only handle a certain power level, you can definitely change up some finder pieces and lens to diversify your experience.